A new range of Tektronix-to-Agilent probe adapters has been introduced by Agilent Technologies to enable engineers to connect Tektronix probes to Agilent’s oscilloscopes. 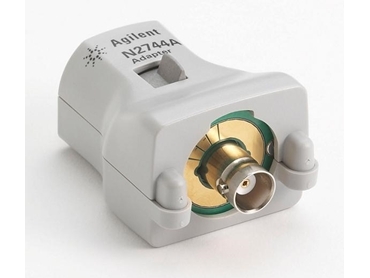 The N2744A T2A probe adapters connect Tektronix TekProbe-BNC Level 2 probes to Agilent's Infiniium and InfiniiVision oscilloscopes. Introduced as a solution to meet customer needs outside of Agilent’s traditional product offering, the probe adapters provide the necessary probe power, calibration and offset control to Tektronix probes. Engineers who already own Tektronix active probes are benefited by the new adapters as they can now use Agilent oscilloscopes without having to purchase new probes.